Per consensus at cdowiki and translatewiki.net, we would need to have Min Dong translations in both Han script (cdo-hani) and Latin script (cdo-latn) separated, and disable cdo as "This language code should remain unused. Localise in cdo-hani or cdo-latn please.". Which code should cdo fall back to? cdo-hant or cdo-latn? Which language should cdo-latn fall back to? What should be the autonym of cdo-latn? The creator of Min Dong wiki (cdo wiki) was GnuDoyng. He was a Fuzhou Christian and the Fuzhou version of Bible was printed in cdo-latn script (Min Dong Chinese, Foochow Romanized script), and therefore he preferred to type in cdo-latn script. As a result, the cdo wiki used to be only written in the cdo-latn script. As time went by, some other native Min Dong speakers came to edit the cdo wiki, and many editors preferred to use the cdo-hani script (Min Dong Chinese, Chinese characters script). As a result, on June 22nd, 2013, the first cdo-hani script entry was added into the cdo wiki. Then, here came many cdo-hani script entries, and the two scripts in our cdo wiki started to run together parallelly. 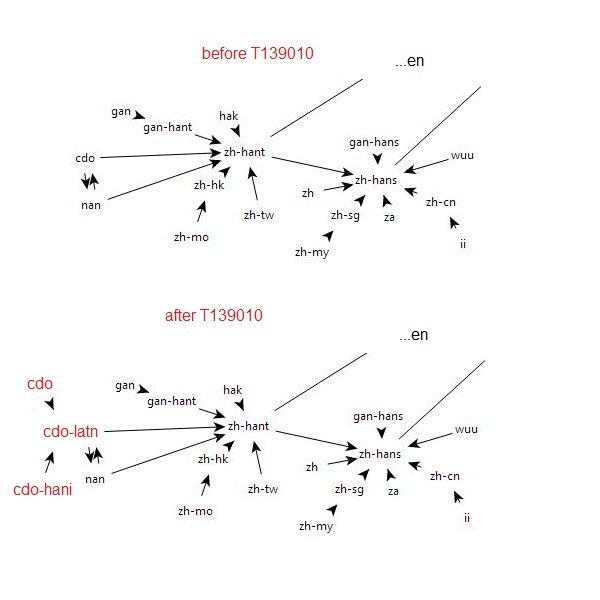 Now we hope these two scripts will be separated into two part, namely cdo-latn and cdo-hani, just like the Chinese wiki, where exists four variant scripts, namely zh-cn, zh-tw, zh-hk and zh-sg. The default/fallback locale does not really matter, I think. It could be either one. If it is really a technical problem, I think the default locale could be cdo-latn, as it contains more entries than the cdo-hani entries. How can we move on this process? Who knows how to contribute something for this project? no LanguageConverter needs to be developed. Currently, if I see correctly, this request doesn't satisfy any of these points, so it's nearly the hardest possible situation to be in. This request is just helpful to let users less mix script localisation. Now translation of cdo has not been splitted. Some translated words was writtern in latn, while some words was in hani. As a result, we can see that Chinese charaters and Roman letters are mixed in the same page. Hani users and latn users are both reluctant to see this situation. If the translation of cdo can be splitted successfully, this problem can also be solved. LanguageConverter is not necessary in this request because we can keep the expressions of hani and latn same manually. Can anyone please clarify whether the scope of this ticket is merely separating the UI translations of cdo into two UI language codes, or does it have anything to do with Min Dong Wikipedia becoming a multi-script Wikipedia? Yes, a multi-script Min Dong Wikipedia is needed, namely cdo-latn and cdo-hani, just like Serbian Wikipedia, but manual conversion is needed, so don't give us any LanguageConverter. The conversion is a single-to-multiple map from either direction, either from cdo-hani to cdo-latn, or from cdo-latn to cdo-hani, because there are too many homophones and homographs. e.g. from cdo-hani to cdo-latn, the homograph 行 can be pronounced as hèng or hòng depending on the context, while from cdo-latn to cdo-hani, the homophone mìng can be written as 閩, 民 or 明 depending on the context. There as a more serious problem for unorthodox writings such as 無年呆, 起動, etc, which may map to "abnormal" pronunciations. Therefore, automatic conversion is almost impossible, unless a language AI is really developed. Moreover, the language name is wanted to change from Mìng-dĕ̤ng-ngṳ̄ to Mìng-dĕ̤ng-ngṳ̄/閩東語, which is listed on the left-hand Languages sidebar. Also, semi-auto conversion between Min Dong scripts is possible, although manual intervention is unavoidable at this moment. The discussion was very pluralistic, many different opinions were shared. 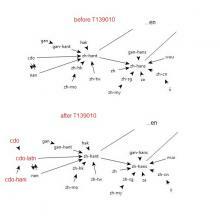 I think the interface of cdo-latn and cdo-hani in Min Dong Wikipedia should be separated.If latn and hani both in one article, the vision effects are bad.And that, cdo-latn and cdo-hani are two totally different writing systems(unlike Chinese simplified and traditional can transform easily), they can't be use together to write an article. Now the most articles, which in the Min Dong Wikipedia, are written in latn.Their existence is valuable, and need not to be changed into hani. I support the opinions of @ztl8702 @Yejianfei.The primary task is not only merely separating cdo-latn and cdo-hani in Min Dong Wikipedia, but also trying to make Min Dong Wikipedia becomes a multi-script Wikipedia. Some might say cdo-latn and cdo-hani can't correspond word-to-word, but we can see Serbian Wikipedia, which is a good example.We should have the idea(make a multi-script Min Dong Wikipedia) firstly, then technology will be considered.Manual intervention or LanguageConverter, there is always a best way to slove problems which might occur possibly. All things considered, making a multi-script Min Dong Wikipedia is arduous, which require the support from all of us. Above is my statement for my personal opinions. Serbian Wikipedia is the same as simplified Chinese characters to traditional Chinese characters convertion. Cyrillic and Latin scripts are strictly one-to-one mapping (see this table), which is known as transliteration, even stricter than simplified Chinese characters to traditional Chinese characters. Simplified Chinese characters to traditional Chinese characters convertion includes very few examples of one-to-mutiple conversion, such as 发 mapping to 發 and 髪, which does not even exist in the conversion from Cyrillic to Latin scripts. All of two paragraphs above I wrote are not important. The only important thing is to make it a dual-script Wikipedia now according to the our consensus. Split the interface now, and change the language name from Mìng-dĕ̤ng-ngṳ̄ to Mìng-dĕ̤ng-ngṳ̄/閩東語, which is shown in the left-hand Languages sidebar. Steps: First, change the language name shown on the left-hand Languages sidebar from Mìng-dĕ̤ng-ngṳ̄ to Mìng-dĕ̤ng-ngṳ̄/閩東語. Second, split https://cdo.wikipedia.org/wiki/ into https://cdo.wikipedia.org/cdo-latn/ and https://cdo.wikipedia.org/cdo-hani/. Let's do it now. Can this issue be solved by creating instead separate namespaces ("Hani:" and "Latn:") in the cdo wiki for articles that are not mixing scripts and not using autotranslation? And then keep the "/wiki/" path unchanged (so that it will work correctly for interwikis with other languages). This does not man that the UI cannot be separated in its translation, however this means that namespaces should have distinct default language codes using distinct scripts; The "Hani" part would have the Hans<->Hant transliterator handled as a variant selectable by viewers, but not between Hans<->Latn and Hant<->Latn. I would take my point, that do we really need to introduce hans to Eastern/Middle/Northern/Southern Min? As Yejianfei said above many times, hans was made for Mandarin (cmn), and probably suitable for Cantonese (yue), kindly suitable for Classical (lzh), works better for Wuu (aka Shanghainese), suitable for Sichuanese (though a code request is recently rejected by SIL due to concerns from Academical communities in Sichuan (itself, 囧rz)), and maybe somewhat suitable for Japanese (hehe) and Korean (another hehe), as picking a good translation for foreign languages' words won't be affected by different means of random single han character. However, there's really a cul-de-sac issue in pan-"Fujian+Eastern Guangdong+Southwestern Zhejiang" society that such "flexible" isn't existing in whole Min history and future, which is the reason that user aganist hans in his original request. I think it is a good idea to solve problems about interwiki links, so that articles written in cdo-hani can also be found easily in the left-hand Languages sidebar. This problem has been dragging on for too long. Mindong Wikipedia has already had 14,259 entries. The sooner the problem is solved, the more successfully it will be for Wikidata to create links to existing entries, the easier it will be for readers to read articles in Mindong Wikipedia. The solution, as everybody here has suggested in the past two years, is to create two language codes without splitting the site: cdo-hani and cdo-latn. https://cdo.wikipedia.org/cdo-hani/, the interface text is Chinese characters. https://cdo.wikipedia.org/cdo-latn/, the interface text is Foochow Romanized. Translatewiki may need to be optimized accordingly. The sooner this proposal is implemented, the sooner we can provide the interface text of the Chinese characters version. Up to now, Chinese character entries and Romanized entries rely on templates. With Wikidata, links will be more standardized. Mindong Wikipedia has 14,259 entries up to now. The sooner this proposal is implemented, the sooner we can use robots to import links between entries into Wikidata and manually resolve the remaining links (usually some categorie pages and template pages).